Hours: Sunday thru Thursday, 11 to 6. Friday & Saturday, 11 to 7. 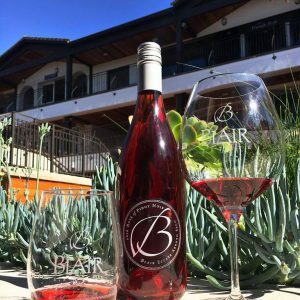 The charming Blair Estate Tasting Room is situated on the Lower Level of the Carmel Plaza in downtown Carmel-By-The-Sea. It is right in the heart of the shopping / restaurant district and a must-stop on the Carmel Wine Walk. Guests will often find Jeffrey behind the tasting bar, sharing award winning releases and special “tasting room only” items.